1. What types of image formats are supported? 2. How many photos can be added to one slideshow? 3. Can I mix videos with photos? 4. What types of videos formats are supported? 5. How to change photo order in the slideshow? 6. How to import photos from Picasa? 7. All photos in the saved project are missing when I open it after. Why? 8. How to fix the empty photo album and missing pictures errors? If you want to burn the slideshow to DVD or VCD, you have to take the disc capacity into consideration. The storage capacity of standard DVD disc is about 4.7 GB, while the storage capacity of VCD is roughly 800 MB. One 4.7G DVD-R disc can holds more than 1,000 photos with background music. Photo DVD Maker calculates the disc space used when photos or background music are added into the slideshow. At the bottom of the main window is the status bar, where you can select the output type, and see if you can still add more photos or music to the slideshow. Case 1: 1398 photos have been added to the slideshow DVD project, and there is still free space. Case 2: The slideshow project with 1398 photos apparently oversize the capacity of one 800MB VCD. In this case, you have to reduce the number of photos in the slideshow to fit the disc capacity. Video clip can be added to the slideshow as a stand alone album. However, video clips cannot be mixed with photos in one album. Photo DVD Maker supports MPEG, MP4, AVI, Divx AVI, WMV, VOB, MOV, FLV, RM/RMVB and ASF video formats. When the photos are added to Photo DVD Maker, you can manually change the photo order or use the auto-sort function. Method 1: Manually change photo order. Step 1: You can drag and drop the selected photos to target position. Step 2: Click the More… button, and select the “Rearrange to Current Viewing Slide Order” option. Step 1: In the Album Photo section, click the “More…” button, and select the “Details” option, you will see detailed properties of the photos, name, size, date, dimension, and file path. Step 2: Click the one of the property tags to re-sort the photos, for instance, click the “Name” tag to display photos by name. Step 3: Click the "More…" button again, and select the “Rearrange to Current Viewing Slide Order” option. 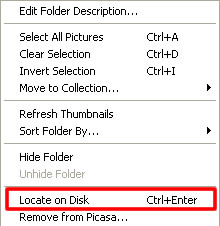 In Picasa, right-click on a selected folder or photo, and choose “Locate on Disk”, and Picasa will take you to the file folder containing photos you want. 2. Select the photos you want to add to the photo slideshow. 3. Drag and drop the selected photos to the Album Photo section of Photo DVD Maker. 7. All photos in the saved project are missing when I open it latter. Why? DVD Photo Slideshow will save the project with the file directory of the photos and the configuration you made to them. It does not include the image files. 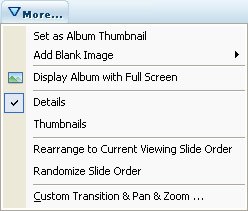 If you move the photos to other folder, or rename the folder, DVD Photo Slideshow will not be able to locate the photos. Then the slideshow project turns blank. Please make sure you did not change the location path of the photos. If you did, you may restore it manually.